Sarah Paradis is the Assistant Professor of Trombone and Euphonium at Boise State University. Paradis earned her B.M. in Music Education from Ithaca College, her M.M. in Trombone Performance from Indiana University, and her D.M. in Brass Pedagogy from Indiana University. Her primary teachers include Peter Ellefson, Carl Lenthe, M. Dee Stewart, Per Brevig, and Hal Reynolds. Currently Paradis is the second trombonist of the Springfield Symphony Orchestra in Springfield, Ohio. She has held principal positions in the Richmond, Indiana and Ohio Valley Symphonies, and she has also played with the West Virginia Symphony Orchestra, the Akron Symphony, the Lafayette Symphony, the Bloomington Pops, and the Owensboro Orchestra. Paradis has performed at the Eastern Trombone Workshop, the International Tuba and Euphonium Conference, and the International Trombone Festival. She was a prizewinner in the Susan Slaughter Solo Competition in both 2010 and 2012, and was awarded the Trombone Fellowship at the Aspen Summer Music Festival in 2011. An active chamber musician, Paradis is a member of several ensembles in addition to Tromboteam! She tours, performs, and gives master classes with the Mirari Brass Quintet. The ensemble regularly performs for university, high school, and community audiences across the country. Paradis is also a founding member of the female brass ensemble Bell(e) Collective, which commissions new music for low brass and continually strives to empower young women to pursue musical excellence. Paradis can be heard on Spires, Mirari’s debut album, and on Ursa, the solo album by Stephanie Frye, co-founder of Bell(e) Collective. Paradis is a low brass instructor for the Bluecoats Drum and Bugle Corps, and a former euphonium player in the ten-time World Champion Drum and Bugle Corps, The Cadets. Paradis has taught privately at Indiana University and throughout the Midwest. Formerly, she has taught music theory and applied trombone, euphonium, and tuba at Bemidji State University. 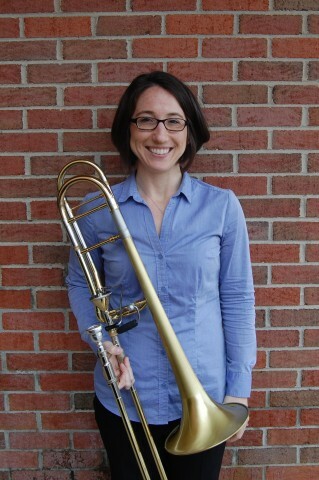 Most recently, she was the Assistant Professor of Trombone at Ohio University, where she taught applied trombone, directed the Trombone Choir, and taught courses in trombone pedagogy and rock n’ roll history.